We’d love your help. Let us know what’s wrong with this preview of Doctor Who by Naomi Alderman. This starts with the wrong biscuit a digestive that far to quickly sinks to the bottom of the cup. From then on Mr Brown 's life is running around like a headless chicken in ever decreasing circles sweaty late all the time. I know that lot of Jobs in office environments are exactly this for me sound like has Nightmare out of worst horror movie. Blood suicidal depression like the office revolution in Monty Python's Meaning of Life. For Mr Brown is hair pulling days are over when two crazy heavies tu This starts with the wrong biscuit a digestive that far to quickly sinks to the bottom of the cup. For Mr Brown is hair pulling days are over when two crazy heavies turn up load sharks on the Sea of Time straight out of Neverwhere - we can give you that extra time . The under cover 007 Rory working for mad Doctor in a box no M just an Amy . Do you ever wish you could just have a little more time to get everything done? Would you consider borrowing some? Using the banking crisis as an analogy, this excellent 11th Doctor story simplifies how easy it is to run up a big debt without properly looking at the Terms and Conditions. Not only is this a great thrilling adventure, it also gives a great moral story to younger readers on how on easy it is to fall into that trap. One of the best NSA’s. What a fun Doctor Who story! I especially liked that ending. The author and the narrator totally hit the mark with the some of my favorite chat, The Doctor, Amy, and Rory. Besides the bit about Narnia, the epilogue had to be my favorite part! This is a story of investment banking, the white-collar rat race, fraud, debt, the subjectivity of value, and the dangers of compound interest... sort of. It’s not about money or stocks, though. It’s about time -- using it, managing it, borrowing it, trading it, and paying it back -- with interest, compounded hourly. An alien time trader has come to Earth and is loaning harried bank employees the time they feel they need to conduct research, prepare reports, do presentations, and everything else This is a story of investment banking, the white-collar rat race, fraud, debt, the subjectivity of value, and the dangers of compound interest... sort of. It’s not about money or stocks, though. It’s about time -- using it, managing it, borrowing it, trading it, and paying it back -- with interest, compounded hourly. An alien time trader has come to Earth and is loaning harried bank employees the time they feel they need to conduct research, prepare reports, do presentations, and everything else necessary to climb the corporate ladder while still having some time for themselves and their families. The snag is that the time must be paid back, and under the fine print terms of the contact, some people find themselves owing more than a lifetime. The 11th Doctor, Amy, and Rory must expose the dangers of borrowing on the future because if they don’t, humanity may not have one. This novel has a serious and timely underlying theme, although the story itself is not to be taken seriously. I seriously love books like this. There are far too few of them. When Doctor Who is done well, though, it can provoke thought about a serious idea and still be fun. This story does that well enough. I won’t say it’s not without some flaws. I thought the characterizations were just a bit off. The Doctor was perhaps a bit too eccentric and Rory a bit too goofy, and the bank employees, well, they were unbelievably oblivious to the strange things going on around them. But, all in all, I enjoyed this book. It’s a quick and easy read and a great way to spend an evening or two between Doctor Who episodes. I recommend it to all Doctor Who fans and other lovers of positive science fiction. The author managed to really catch the characters extremely well - it felt like watching an actual episode! One of the best Doctor Who stories I read so far characterwise. Both in Amy, Rory and the Doctor feeling very true and also in the main characters being well fleshed out. The plot also was both really interesting and well thought out! I was hooked all the way. Prose was fluent and fast and a perfect match for the story. Full 5 stars Loved this one! Naomi Alderman's story in Granta 123: The Best of Young British Novelists 4 was a very funny Gaiman-esque mythology-meets-reality piece. So I wanted to see what she would do with a Doctor Who novel. I wasn't that impressed. I've never read any Doctor Who fiction before - though a number of my friends have between them read hundreds of volumes of it, so I'd never dismiss it out of hand when such clever people read (and write) it. But I can't say how this compares to other Who stories ... and that Naomi Alderman's story in Granta 123: The Best of Young British Novelists 4 was a very funny Gaiman-esque mythology-meets-reality piece. So I wanted to see what she would do with a Doctor Who novel. I wasn't that impressed. I've never read any Doctor Who fiction before - though a number of my friends have between them read hundreds of volumes of it, so I'd never dismiss it out of hand when such clever people read (and write) it. But I can't say how this compares to other Who stories ... and that's what I'd most like to know. Borrowed Time trundled on satisfactorily enough, like the books of middling comic fantasy writer Tom Holt: derivative and therefore slightly bland style, and a mixture of the embarrassingly obvious and rather clever. Seeing yet another allegory for the banking crisis made me groan: in 2006 or 7, staff at the London branch of an international bank are approached by two oleaginous aliens, Mr. Symington & Mr. Blenkinsopp, and offered watches which allow them to rewind time and get more work done, in return for an apparently low rate of interest of 5 minutes per hour. The time-lenders can also take the bodily form of sharks ... geddit ... but at least the system is quite intricately designed, albeit with a couple of holes I thought I spotted. I've never been very interested in futuristic time travel, but when stories involve travel to the past, whether for historical tourism or revising bits of your own life, I generally love it. So at least I was more sympathetic to this than if it had been a story of fighting random aliens, which would have needed to be very funny to keep me interested. Unfortunately I don't like the characters from the Eleventh Doctor series as much as those from the 9th and 10th. The Doctor and Rory seemed true to type though I wasn't so sure about Amy who too often, especially in the first half, seemed mostly to be doing things because they fitted the plot. The writing was simpler than I expected but a couple of other reviews indicate that kids and teenagers are a big market for these books. The other times I've read children's books by writers whose adult fiction I like, I've often been disappointed; perhaps with a smaller vocab an interesting style just isn't so forthcoming. So here we have ‘Doctor Who’ does the financial crisis, with The Doctor taking Amy and Rory to witness the biggest banking collapse of the age. Obviously that’s a set-up containing a great deal of promise, but there’s also something a tad disquieting about it. After all if The Doctor is involved, then there will obviously be malevolent aliens involved somewhere in this crash. But why would human beings need malevolent aliens to crash a bank? Human beings have more than proved themselves stupid e So here we have ‘Doctor Who’ does the financial crisis, with The Doctor taking Amy and Rory to witness the biggest banking collapse of the age. Obviously that’s a set-up containing a great deal of promise, but there’s also something a tad disquieting about it. After all if The Doctor is involved, then there will obviously be malevolent aliens involved somewhere in this crash. But why would human beings need malevolent aliens to crash a bank? Human beings have more than proved themselves stupid enough, greedy enough and venal enough to crash a whole world economy, what would they need outside help for? Introducing outside extra-terrestrials does make it seem like some of the culpability is being removed from the bankers, the asset traders and the other functionaries of greed, and they are people who should feel really, very, incredibly culpable. Fortunately the book doesn’t go quite in that direction. Instead what plays out is a chase through corridors with a few broad swipes at credit cards, pay-day loans, loan sharks and other tricks of high interest lenders, but it’s all done for laughs and (ironic really, given that the loan sharks are actually walking sharks) somewhat without teeth. What we have here is a romp in a high-end office block and around the City of London. It’s perfectly serviceable in what it does, but doesn’t have the reach or the scale of Una McCormick’s ‘The King’s Dragon’. Amy particularly suffers in comparison to that book. Whereas in ‘The King’s Dragon’ she was impatient force pushing the book along, here she’s the idiot member of the team who goes and does something stupid. It’s all slightly disappointing. After Jonny's excellent Who book Touched by an Angel, I didn't think the next book could live up to it. I was wrong. Less concerned with emotional depth than Jonny's, this is far more a satirical, even political book, exploring the recession and bank collapses - right in line with the show's original remit to educate and entertain at the same time - I can't recall a Who book ever taking the time to explain the workings of compound interest before! Given the complexity of the ideas she explores, a After Jonny's excellent Who book Touched by an Angel, I didn't think the next book could live up to it. I was wrong. Given the complexity of the ideas she explores, and the huge difficulty of communicating them for kids and being fun and exciting at the same time, it's hugely impressive how brilliantly she manages to pull it off. "Oh god, has the Doctor decided I'm useless, well I am useless, but maybe I'm useless in that useful sort of way? Bait, maybe?" It really breaks my heart how cruel these books are to Rory - he's always being left behind and picked on by Amy and the Doctor and it makes me just want to go and give him a big hug. So far, I've yet to encounter one of these books that doesn't patronise him on a depressing level. But maybe I'm just overly smitten with Arthur Darvill . 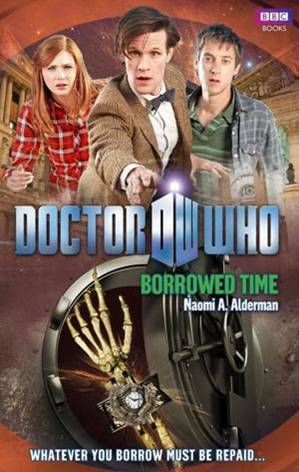 . .
Borrowed Time is a really great adventure with the Doctor, Amy and Rory. The Doctor has been wonderfully depicted by Alderman and I think Amy has too (I often find she's the character who waivers the most). So, what happens? After an interesting and seemingly abstract beginning with Amy and Rory stuck inside a bubble that slows down time so that they can watch this particular sunset for, well, for three hours, we move on to the time borrowing endemic that is sweeping the Lexington Bank - and possibly the world. The curious characters of Mr. Symington and Mr. Blenkinsop are handing out wrist watches to the time-pressed employees of the bank with offers they think "you'll find hard to refuse". *Insert sinister laugh here*. All one has to do is twist a dial and hey presto! Back in time you go. Need to get a report done but also have to be at a meeting? Why not do both at the same time?! Perhaps the easiest way to understand this is to think of Hermione and her time-turner in Harry Potter? Got it? Now, these people must also repay their time. Yes, you see where this is going? Good, good. Because this is borrowed time that has some severe compound interest (the concept of which only the cake analogy made clear to me). The problem? No one reads the fine print. Thank goodness for the Doctor. I just found the plot in general to be highly entertaining. It's jam-packed with energy and the Doctor is alarmingly realistic. We've got new aliens and original ideas - what else do you need? I found this a refreshing break in the Whoniverse, and I definitely tip my hat to Alderman for tackling the sensitive topic of time and what exactly the rules and regulations are. The only thing I found didn't sit with me was the one-line reference to these baddies out-smarting the Shadow Proclamation. Uh-uh. In my rule book, that just doesn't happen. But as I said, one line, I dare say I shall soldier on and live to read another day. And HOORRAY, excellent plot twist Alderman, excellent plot twist. There was so much on the go that I didn't have time to predict that one, or expect it. *Round of applause*. There's truly not a lot to fault this book on. This relationship always breaks my heart. Rory spends what, 2000 years waiting for Amy? And most of the time he's worried she'll just ditch him. Sad face. I wish he had more faith in her and belief in himself. That being said, I think their relationship is pretty accurate . . . Rory doing what he's told and sticking to the rules, and Amy stuffing it all up. Amy has a decent sized role along with a substantial amount of flirting and Rory gets to (almost) go in a date (twice) with his wife. *Aww*. See? It really has covered everything, this book. I loved the fact that there were references to Rory's 2000 years waiting and Amy's parents actually existing - it slips nicely into the time continuum. Fittingly, I read this one entirely on a plane taking me first to and then again back home from the Doctor Who Festival in London last weekend. And it reminded me once again that while the Twelfth Doctor is MY Doctor (and this is where I'm really tempted to insert some utterly fangirlish, smitten gushing over how ridiculously gorgeous Peter Capaldi is in real life, especially close up, and how wonderfully firm and warm his hand is, and how radiant and genuine his smile is, and how I melted into Fittingly, I read this one entirely on a plane taking me first to and then again back home from the Doctor Who Festival in London last weekend. And it reminded me once again that while the Twelfth Doctor is MY Doctor (and this is where I'm really tempted to insert some utterly fangirlish, smitten gushing over how ridiculously gorgeous Peter Capaldi is in real life, especially close up, and how wonderfully firm and warm his hand is, and how radiant and genuine his smile is, and how I melted into a little puddle of goo when getting my photo with him), some of my favourite Doctor Who in book form is still, and consistently, from Eleven's era. I don't know why this is but somehow most authors seem to have an easier time getting a good handle on the characters and their voice with Eleven, Amy and Rory, and when you add in a really rather original, interesting plot - because at least I haven't seen a lot of sci-fi or time-travel stories that take place almost entirely in a contemporary 21st century London bank, with a lot of talk about presentations and board meetings and compound interest etc - then the result can't really be anything but a pretty great book. As I picked Borrowed Time up and started to read, I had a nagging feeling I knew the author name from somewhere, and sure enough, the author is the very same Naomi Alderman who more recently wrote The Power, a bestselling science-fiction novel with a feminist plot twist, which has been the talk of the broadsheet culture supplements. There are plenty of signs in this earlier work that the author would go on to greater things, as this is certainly one of the best examples of new series Doctor Who n As I picked Borrowed Time up and started to read, I had a nagging feeling I knew the author name from somewhere, and sure enough, the author is the very same Naomi Alderman who more recently wrote The Power, a bestselling science-fiction novel with a feminist plot twist, which has been the talk of the broadsheet culture supplements. There are plenty of signs in this earlier work that the author would go on to greater things, as this is certainly one of the best examples of new series Doctor Who novels I've read. Events take place in the capitalist environment of a multinational bank, which calls to mind the recent TV episode Oxygen. If (like me) you were turned off that story by the didactic dialogue and promotion, you might think this book isn't for you. However, although it certainly could be read as parable on the dangers of greed, this never overwhelms the story to the point where it feels less an adventure, and more a lecture. Quite the opposite; it is a hugely entertaining ride that adeptly spins financial tropes such as "compound interest" and "loan sharks" on the way to great effect. Regular characters of the Eleventh Doctor, Rory and Amy are present and convincingly correct, with this incarnation's manic energy - the arms and legs all over the place and the mouth which never stops talking - beautifully portrayed, as are Amy's moody turns and Rory's unswerving loyalty. Characters, monsters and gadgets are developed fully with a humourous eye for detail - I particular enjoyed the camera from the future that addresses its user in Chinglish. The climax of the book - which sees the Doctor separated from companions - is especially effective, to the point where I couldn't put the book down for the last fifty pages or so, a rare experience for me. And to round things off, in the last few pages there is a delicious hint of a sequel set in the past. I really liked this one... xD It would have made a great episode, too. Eğlenceli bir Doctor Who hikayesiydi. Doctor, Amy ve Rory üçlüsünü hep sevmişimdir, bu kitapta da üçlünün birbirleriyle olan ilişkisi beni duygulandırdı. Okurken keşke bu kitabı izleyebilseydik dedim çünkü içinde harika bir DW bölümü olmasını sağlayacak her unsur vardı. Biraz yavaş ilerledi onun dışında sonunu da sevdim. kurzweilig (nur so ein, zwei Passagen, die ich etwas langatmig fand). Die Handlung findet irgendwann nach "Pandorica" statt und vor diesem Hintergrund nervt mich ein wenig, wie die Autorin Rory sich selbst wahrnehmen lässt (auch bei Einbeziehung des eröffnenden Zweiteilers von Season6 stellt sich das - jedenfalls für mich - anders dar). Another brilliant Eleventh Doctor novel with an interesting premise. I for one have certainly wished I had more time and the moral of Borrowed Time - be careful what you wish for as it comes at a price! An enjoyable read. Not sure if this is aimed at adults or children but I (as an adult) find the metaphors to poorly regulated financial markets and people playing fast & loose with the markets confusing as well as a bit contrived. I quite loved Jane, she's probably my favorite character in this story. I feel that the dynamic between the Doctor, Amy and Rory was perfect and well written. Plot twist: Loved it! I did see it coming and was happy that it did. I would have been sorely disappointed had it not happened. As one of the Doctor Who audios, this one wasn’t too bad. The plot was inventive. However, neither the writing nor the reading of this book could differentiate the 11th doctor from the rest. If it weren’t for Amy and Rory, it could have been any of the (male) doctors. When the Doctor takes Amy and Rory to witness a bank’s collapse, they find it’s been offering more than just money for loan… This belaboured parable of compound interest isn’t without merit; it just takes up more time than it can repay. A really wonderful Doctor Who book, among the best of the New Series range. Alderman skillfully mixed perfect characterization, time-wimey plotting and commentary on the financial system. Definitely worth checking out. This review has been hidden because it contains spoilers. To view it, click here. An interesting premise but more could have been done with it. A little allegory for the banking crisis and some loan sharks that are a little on the nose. Characters, especially Amy, doing daft things to move the plot along. It was ok overall. 3.5 stars? It was fun. “The thing about the Lexington International Bank ladder was that it was very long, and climbing it was very exhausting, and so Andrew Brown didn't have a lot of time to think about whether he really wanted to get to the top of it—and besides, since so many other people were climbing too, the view from the top must be worth it.